This is just one of several hundred newly digitised original photographs, posters and notices connected with the First World War in Norfolk. The material is held in the collections of the Norfolk Heritage Centre, Norfolk Record Office and Norfolk Museums Service. Over the course of the next few years the images will be posted on http://www.picture.norfolk.gov.uk/ (the online picture archive for Norfolk County Council Library and Information Service). 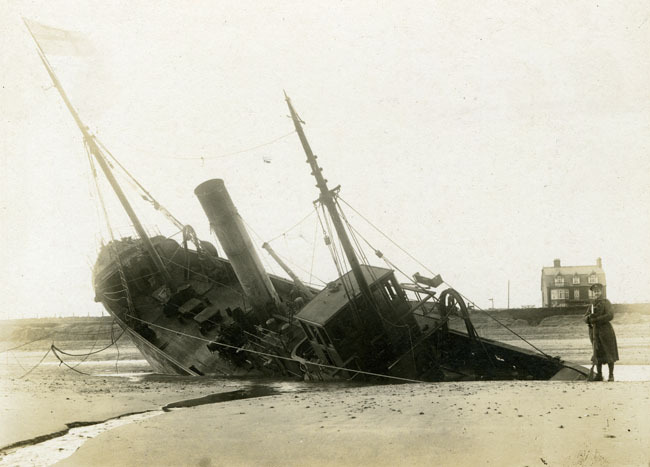 This entry was posted in Local collections and tagged Great Yarmouth, Norfolk, soldier, wreck. Bookmark the permalink.